← Format Book In Word – What Do You Need? NOTE: All security should be removed from a file before you submit the file to CreateSpace. It is very easy to create a PDF of your Word file – it’s matter of saving your Word file as a PDF. Before saving your Word file as a PDF, the fonts on the cover and the interior PDFs must be embedded before you upload your files to CreateSpace. This is to ensure your book is printed as intended. Click Options, then click the Save option in the left hand menu. Click the Embed fonts in the file checkbox (see below). Make sure that both the checkboxes below this checkbox are UNCHECKED. 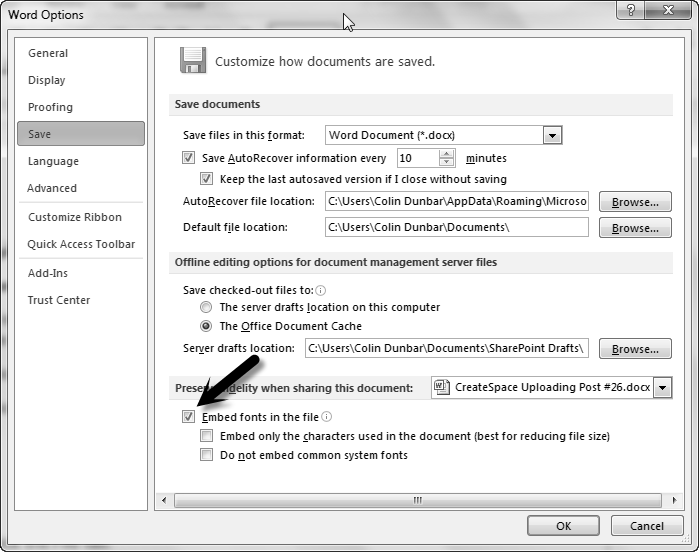 In the Save as type drop-down menu, choose PDF. Your Word file will be saved as a PDF, and ready to upload to CreateSpace. All images (cover and interior) should be at least 300dppi (not lower than 200 dpi). If you used layers (transparencies) in creating your images (e.g. in Photoshop), these must be flattened before you place them in your book or your cover. CreateSpace will attempt to flatten such images, but I recommend you do it yourself. If they are unsuccessful, your file(s) will be rejected. Self-publishing your hard copy book at CreateSpace is not difficult at all. It takes a few minutes to fill in your details and upload your files. You then have the option to order a proof copy, and after approving it, your book will be available at Amazon. Have the above in a text file, then you can just copy and paste when you upload your information and files. 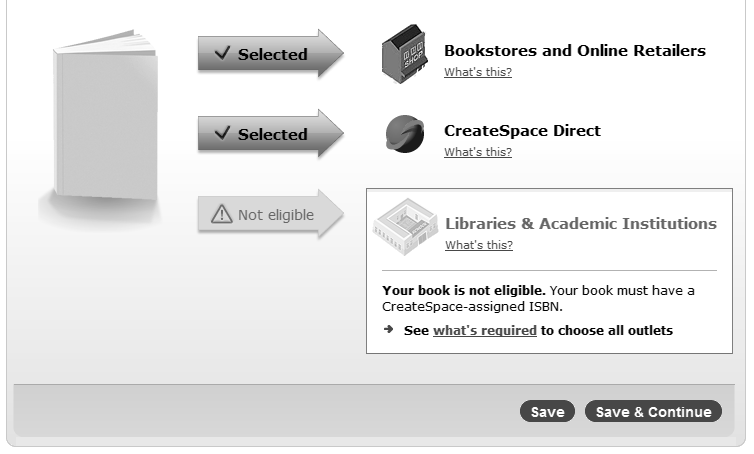 There are 11 steps to add your information and upload your book files to CreateSpace. Click the Buying Copies tab. In the Quantity field enter 1. 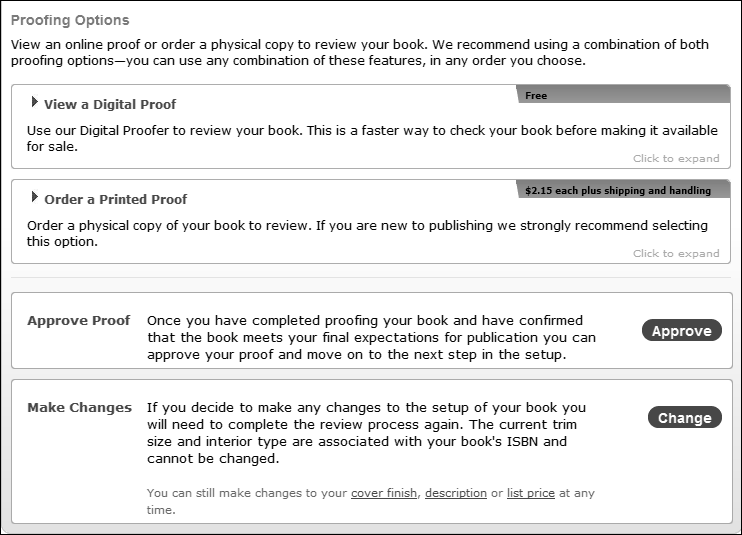 You can also calculate the cost of ordering your proof copies on this page. 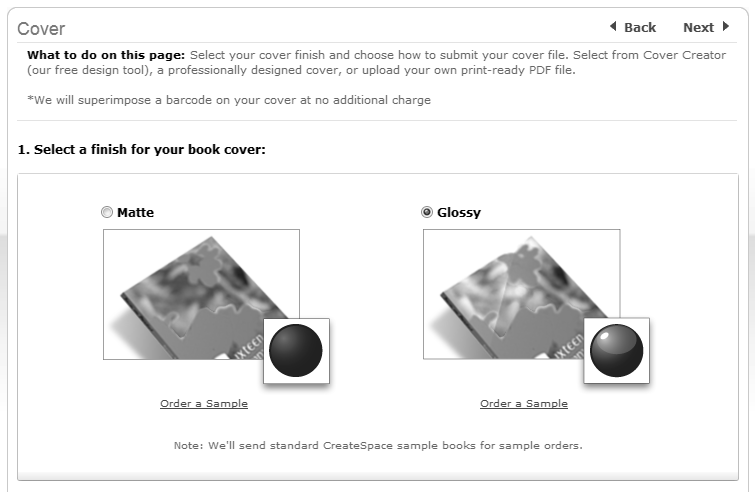 If you don’t have a CreateSpace account, you will need to create one. It’s quick and easy (https://www.createspace.com/Signup.jsp). Click the Add New Title button. NOTE: The information you enter here is the metadata of your book. Type the title of your book in the Tell us the name of your project field (1). Choose the type of project by clicking the relevant radio button (2). You will click the Paperback radio button as you’re uploading a book. Choose a setup process (3). 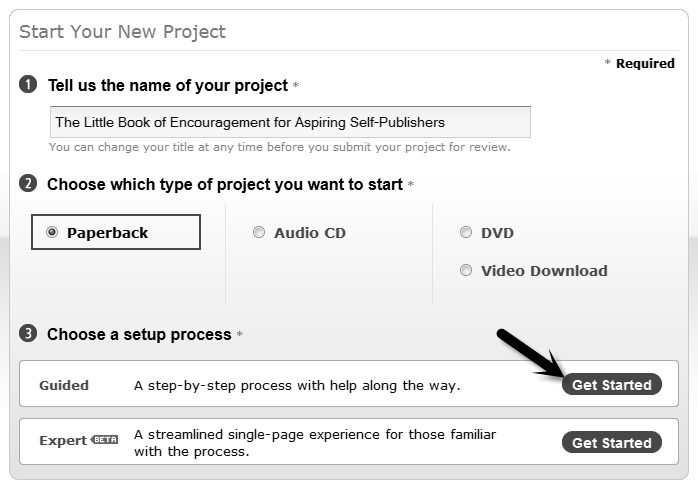 If you’re new to publishing at CreateSpace, choose the Guided option, by clicking the Get Started button in the Guided box (see arrow below). 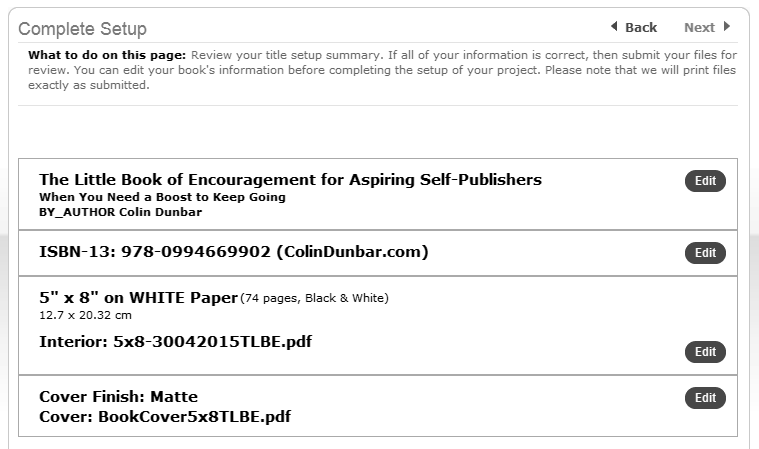 NOTE: The Title Information (metadata) must be exactly the same on the cover and in the interior of the book. Your Title will display as you typed it on the previous screen. If it’s different, type the correct title on the Title Information section. Your title cannot include URLs, and the title cannot be changed once your book is available in your account. Type your Sub-title in the Subtitle field. The title and sub-title must be a maximum of 200 characters (including spaces). Type your name as you want it to appear on your author page at Amazon. If you add a prefix, e.g. Mr, Mrs, etc., that will display on your author page. The name cannot include URLs, and it must be the same on the cover as in the interior of your book. If you want to add contributors, click the drop-down menu adjacent to Add Contributors. There are many to choose from, e.g. Created by, Designed by, Cover Design or artwork by, etc. Scroll down the drop-down menu to see who you want to add. If your book is part of a series, click the series checkbox. Type the title of your series in the Series Title field, and add the Volume number. If your book is a 2nd, 3rd, or later edition, add the number in the Edition number field. If it’s the 1st edition, you can leave this blank. If your book is in a language other than English, choose the language from the Language drop-down menu. Choose the date of publication in the Publication Date field. Choose the date by clicking the pop-up calendar. The date must be the current or prior date. It cannot be a future date. If you enter the date in the wrong format, the following message will display when you want to save or save & continue. If you are ready to proceed with the uploading, click the Save & Continue button. If you’re not ready to proceed, click the Save button. You can then log out and return later. 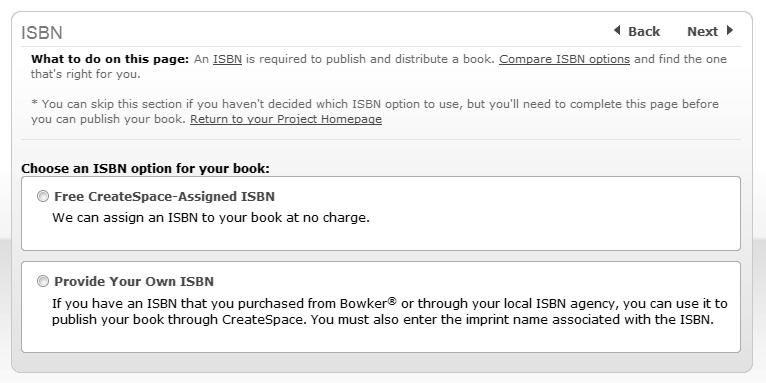 If you don’t have an ISBN, CreateSpace will assign an ISBN free of charge. 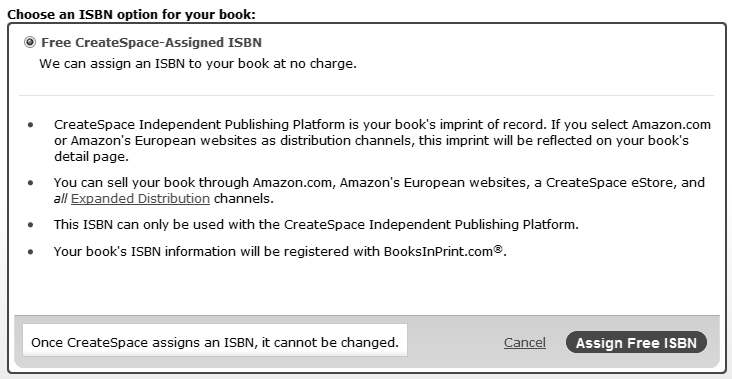 In this case, click the first radio button (Free CreateSpace-Assigned ISBN). 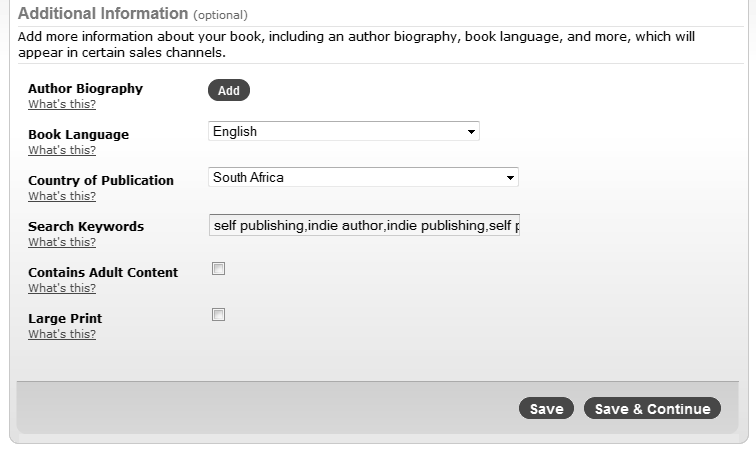 If you have your own ISBN, click the second radio button (Provide Your Own ISBN). NOTE: The ISBN will display on the barcode on the back cover. 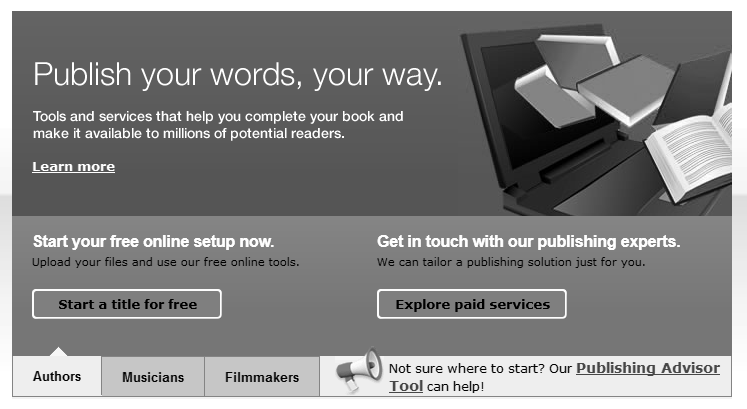 Click the Assign Free ISBN button to continue. 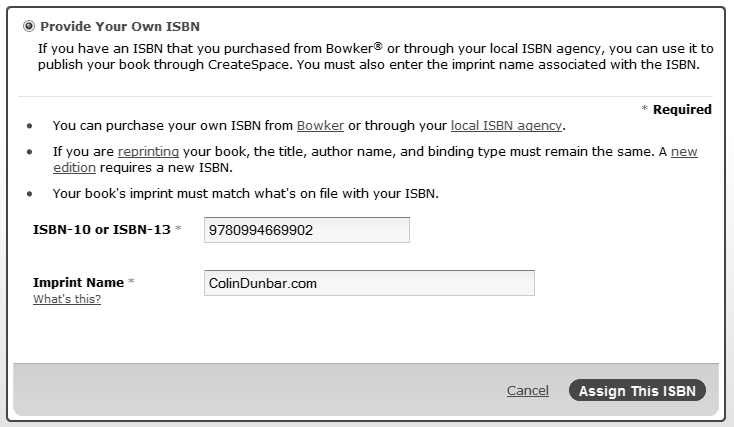 Enter your ISBN in the relevant field (ISBN-10 or ISBN-13). Type the name to which your ISBN is assigned. This will be either your own name, or the business name you are publishing under. Click the Assign This ISBN button. The following screen will display. 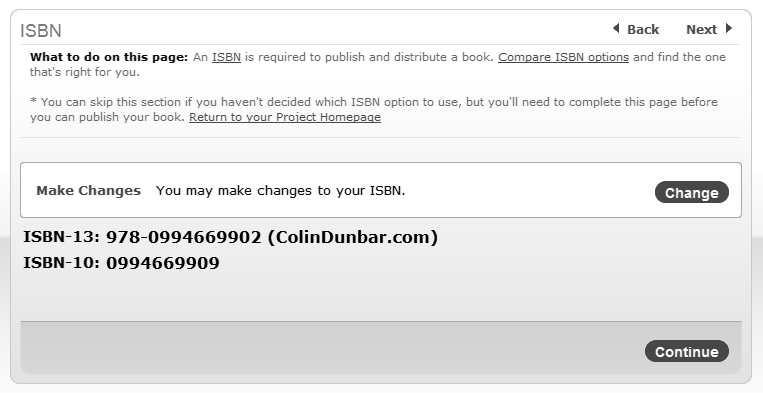 If your ISBN is correct, and you don’t want to make any changes, click the Continue button. 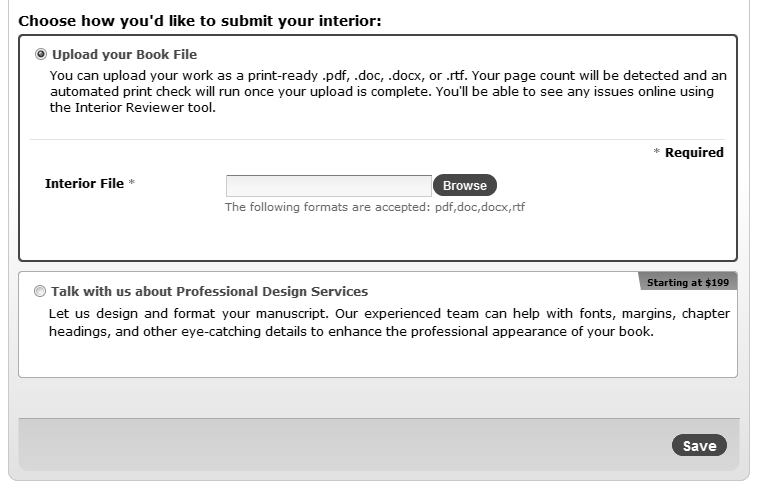 Choose the Interior Type of your book by clicking the applicable radio button, Black & White or Full Color. REMEMBER. The cost of a full color book is more than a black & white book, and this may affect the sales of your book. Choose the Paper Color by clicking the applicable radio button, White or Cream. REMEMBER. Cream colored paper can cost slightly more. 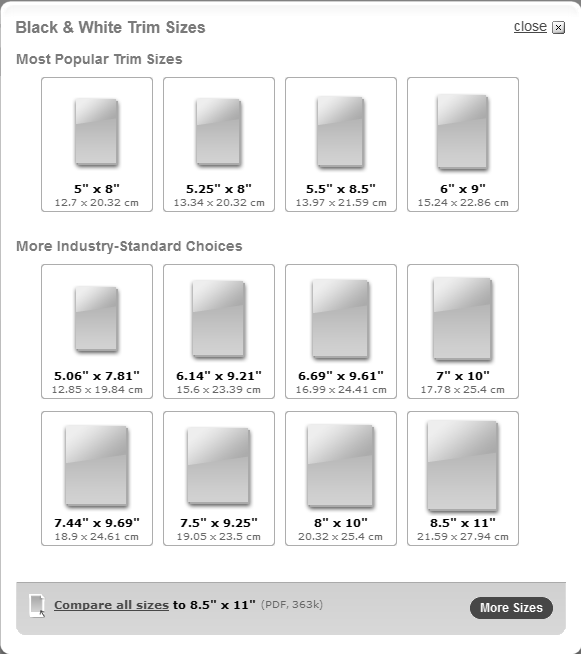 NOTE: The trim size is width x height, i.e. 6” x 9” means the book is 6 inches wide and 9 inches tall. 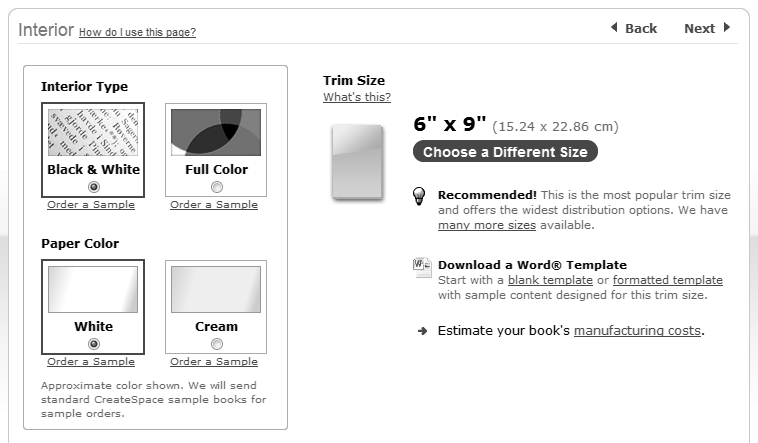 If your book size (Trim Size) is not 6” x 9”, click the Choose a Different Size button. Choose your Trim Size on the pop-up window by clicking the relevant icon. Click the Browse button adjacent to the Interior File field. Locate your PDF book file on your computer and upload it. If you have followed the steps in this blog to format your hard copy book, click the Ends before the edge of the page radio button. 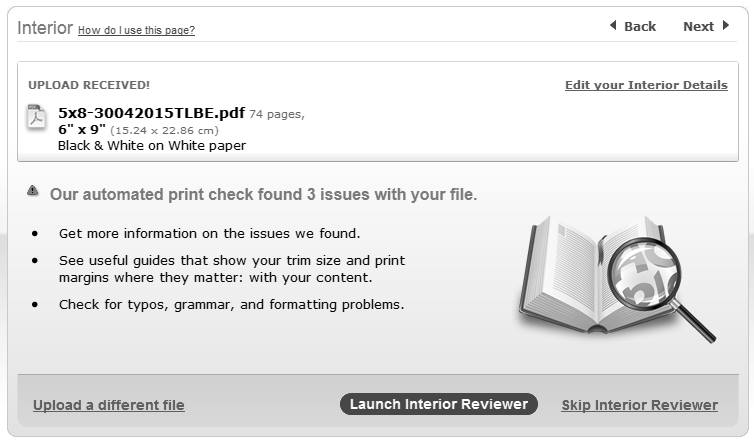 Leave the checkbox for Run automated print checks and view formatting issues online checked. Depending on the size of your book file, the uploading may take a few minutes. While the file uploads, the following message will display. Although the message advises that you can continue working on your book while you wait, I prefer to wait until it’s done, and then I continue. If you receive a message like the one below, i.e. 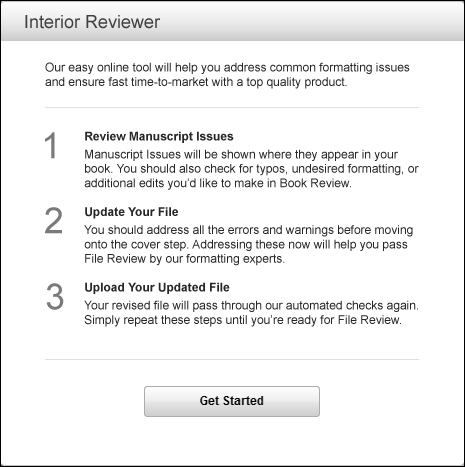 if there are issues with the book file, click the Launch Interior Reviewer button. 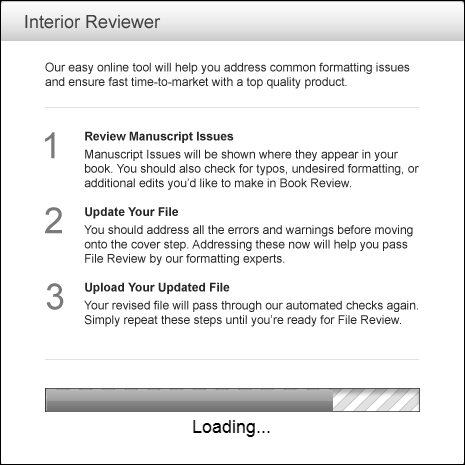 The Interior Reviewer will display your book file online, and list the errors on the right hand side of the window (see example below). If there are issues with your book file, these are listed on the right-hand side of the screen. I highly advise paging through your book in the Interior Reviewer. As you page through, if there is an error on a page, you will see an orange bubble (see below). Click on the bubble and the error details will display below your book pages. 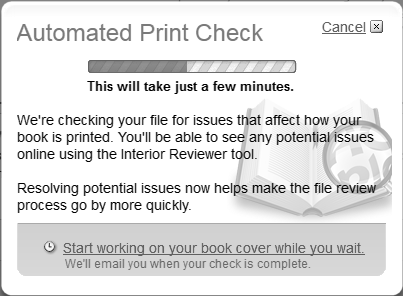 If you’ve gone through your whole book, and noted the errors, you can close the Interior Reviewer by clicking the Close Interior Reviewer link at the top right of the browser window. NOTE. Don’t close the browser window otherwise your CreateSpace session will be closed. If you did have errors, you can make the corrections and re-upload your book file. To proceed, click the Skip Interior Reviewer link. When the following message displays, click the Yes, Skip button. 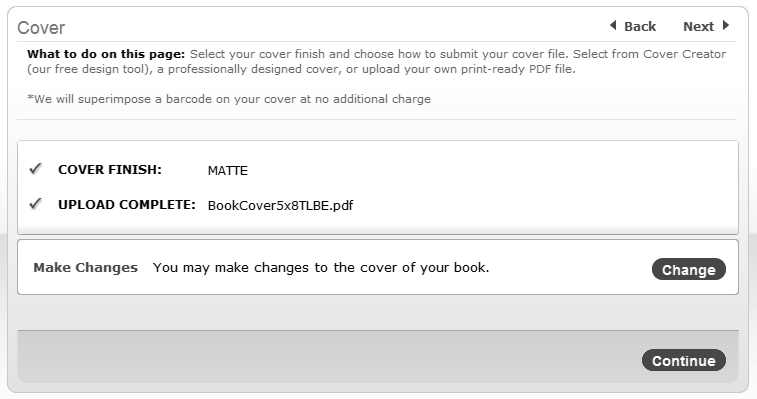 Choose the finish of your cover, by clicking the relevant radio button (Matte or Glossy). Choose the cover option you want to use by clicking the relevant radio button. 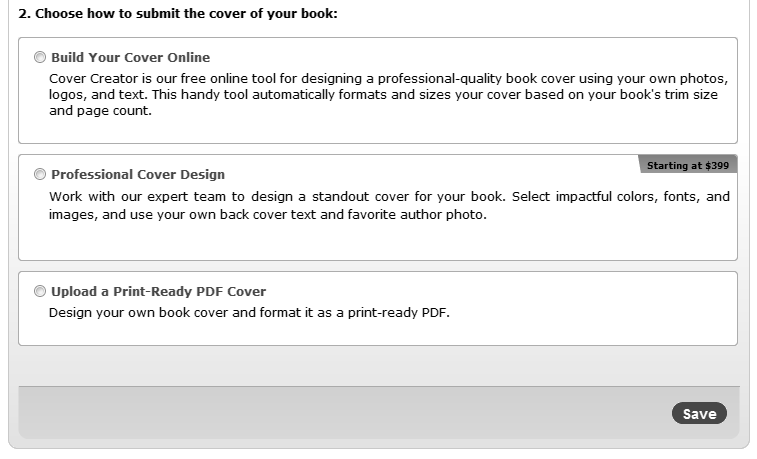 Build Your Cover On Using CreateSpace’s Cover Creator is easy, and you can create quite a good-looking cover. I must mention that your design options (and effects) are limited. If you’re on a tight budget, this is a great option, but if you can afford it, have your cover professionally designed. Professional Cover Design. You can have CreateSpace’s book designers create your cover. 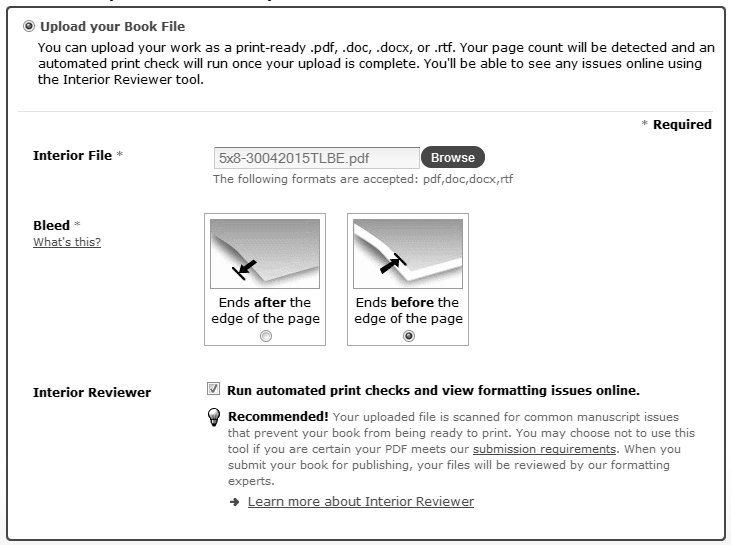 Upload a Print-Ready PDF Cover. 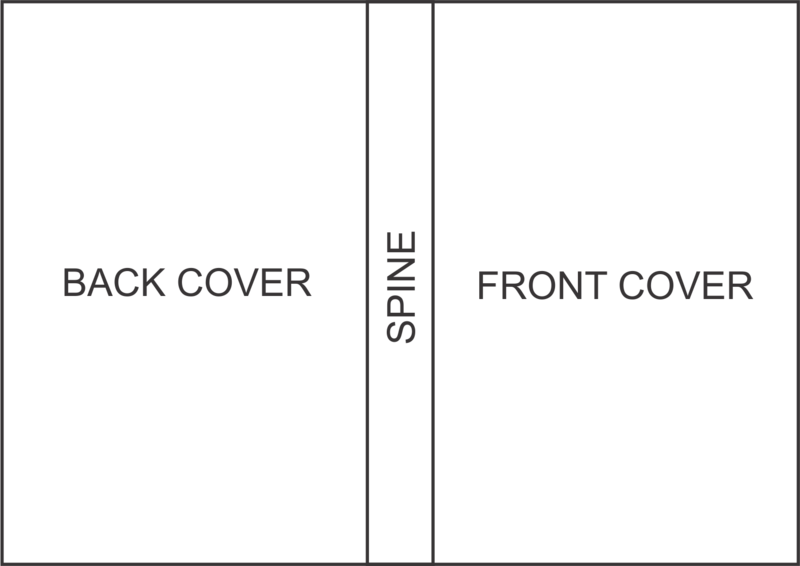 This is the DIY option (or you could have your cover designed by a third party). This is the option I discuss below. Books must have more than 100 pages to include spine text. Locate your PDF cover file on your computer and upload it. The following progress window will display while your cover uploads. Next is the final step in the set up of your book. Read the following screen thoroughly. If you want to make changes, click the applicable Edit button, make the change, and continue. If everything is in order, click the Submit Files for Review button. The following message will display after you submit your files. Click the Continue button. 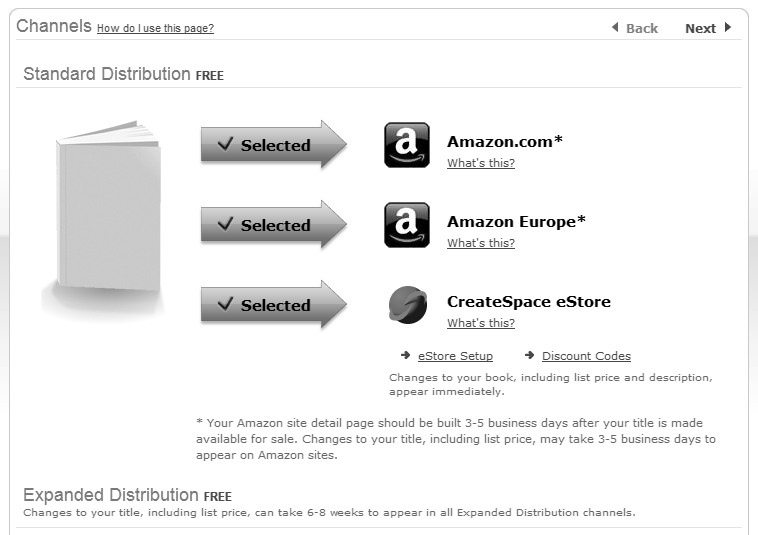 The first 3 options are automatically selected (Amazon.com, Amazon Europe, and CreateSpace eStore). In the next section you need to manually select the additional options if you want to make use of them. 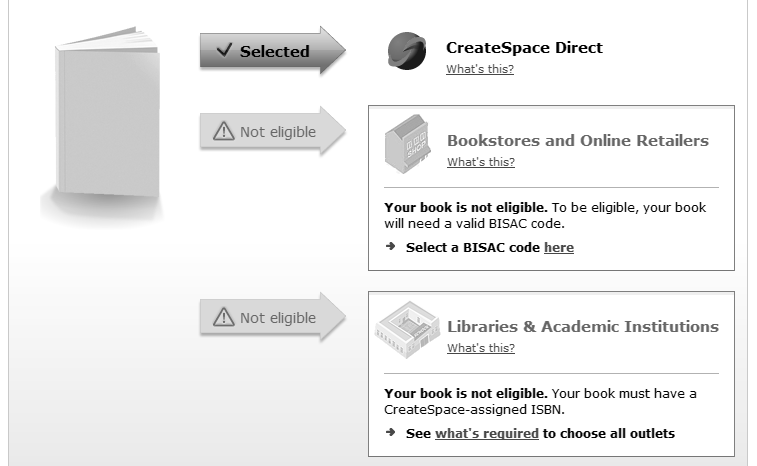 To have your book available to Bookstores and Online Retailers, you need to add a BISAC code. Type or paste your Description in the text box. To choose your BISAC code, click the Choose button. Choose the primary and secondary categories for your BISAC code, then click the Choose this Category button. The Additional Information is optional, but I recommend adding your keywords. Click the Save & Continue button. Your files are now uploaded, and all your book information is submitted. The next screen that displays is relevant if you want to use the same file for your Kindle ebook version. 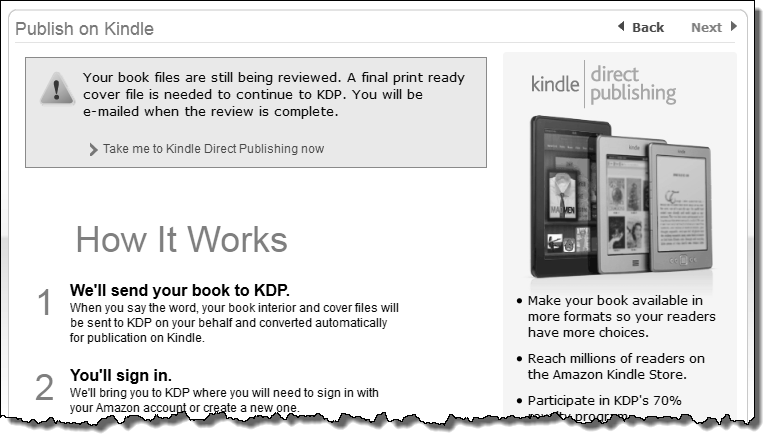 I do not recommend this, as your hard copy file is formatted completely different to that of the Kindle, e.g. there are blank pages. Using this file for your Kindle ebook could annoy your reader. 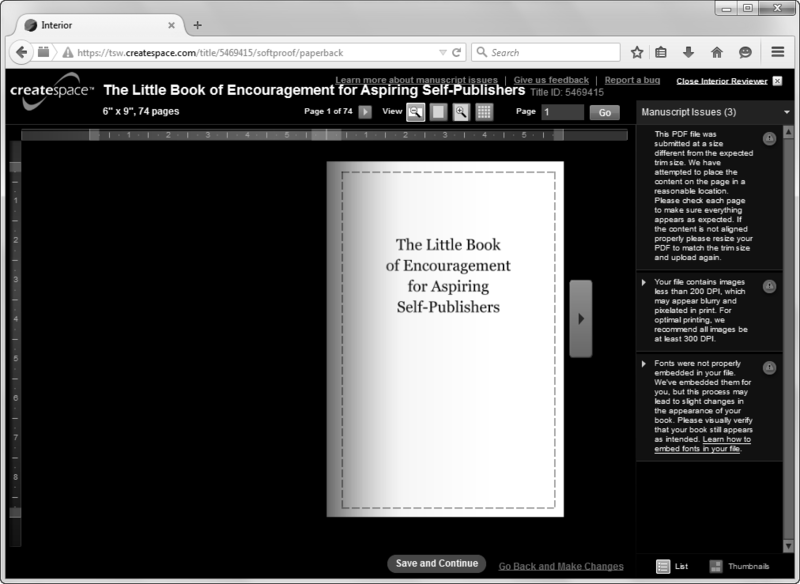 You can download the file that CreateSpace will use for your Kindle ebook. Click the Channels link on the left navigation bar. Choose the 2 options that were previously not available (before choosing your BISAC code). Note that to have your book available to Libraries & Academic Institutions, you need a CreateSpace-assigned ISBN. If your book is relevant to these institutions, choose that option. The final step in the uploading process is the setting of your price. 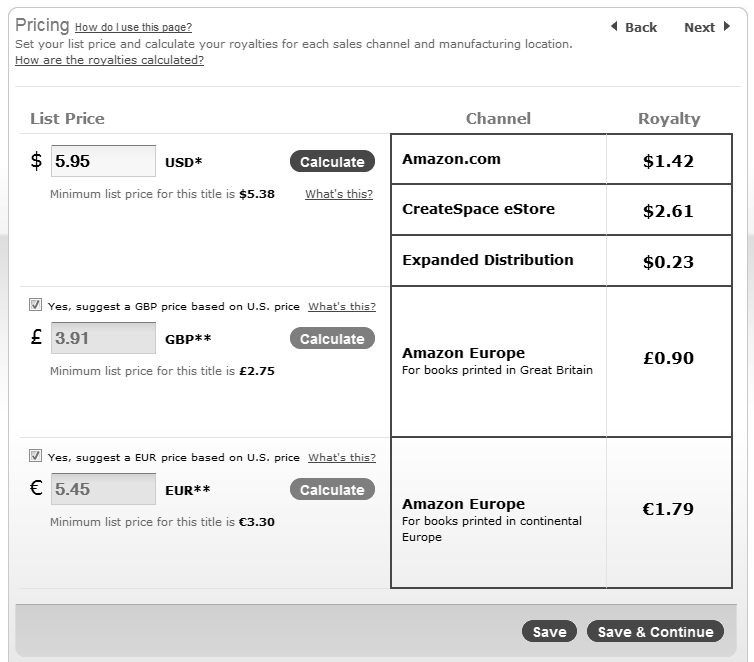 After you choose your channels, the Pricing screen will display. If it does not display, click the Pricing link on the left navigation menu. 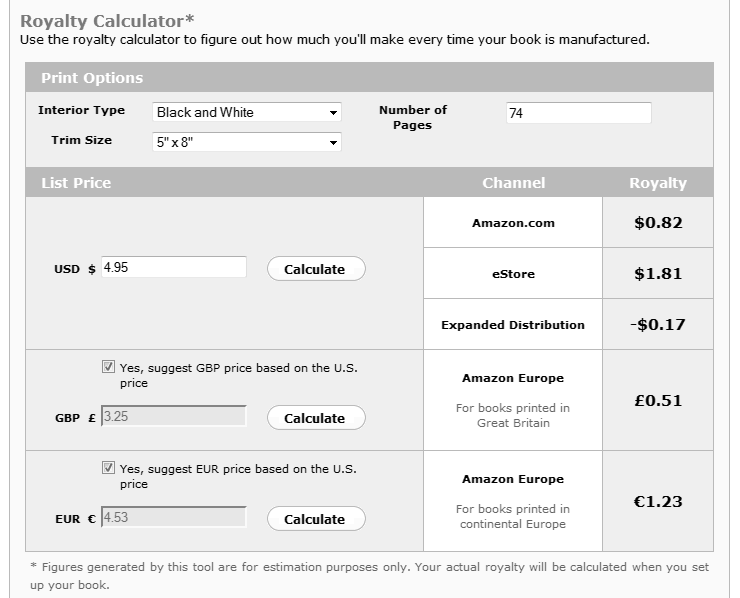 Previously CreateSpace had a calculator that showed the actual cost of a book, but this is what they have now. Choose the Print Options, and then add the List Price. Your royalty figures will be calculated automatically. You can change the List Price as you want to. When you have finished choosing your price, click the Save & Continue button. You’ve just self-published your real, hard copy book, and it’s nearly available at Amazon! Follow the link in the mail. On your Dashboard, click the Order Copies link for your book. To order a proof copy, click the Order a Printed Proof link. Although you can approve your book online, I always recommend checking the actual hard copy book. Order your proof copy, and log out of your account. When you receive your book, and you’ve checked it, you can log in to your account again. 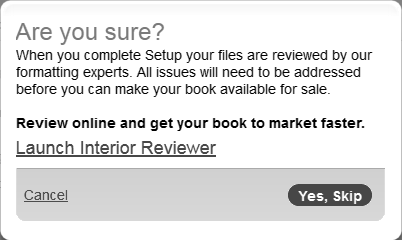 Click the Approve button to approve your book. You can now return to your dashboard, and log out. And so we come to the end of our journey. You have now formatted your Kindle ebook, and uploaded it to the Kindle Store at Amazon. Your Smashwords ebook is formatted and is also uploaded to Smashwords. And you have formatted your hard copy book that is uploaded to CreateSpace, and is available at Amazon. You are now a self-published writer! Reblogged this on HubBooks Literary Services. Thanks for the reblog, Sylia. Really appreciate it. 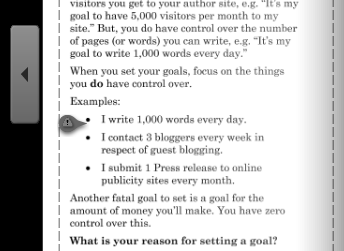 This is the most thorough (yet simple) tutorial I have seen on self-publishing. This is such a long and useful post! Your book looks great too. I’d leave the blogged version up, it’s good for traffic: Also teaching how to format with pictures and text is tricky; it’s faster to make videos of each step in the process – you can link back to it from inside the book as bonus content. Thank you for your kind words and suggestions, Derek. I was leaning towards leaving the blogged book up.